The Chart object that ships with Microsoft Office can be daunting to use, but it also lets you create very flexible displays. In this article, Garry Robinson shows you not only how to use this powerful tool but also a way to generate the code to use it. Microsoft Access ships with many smart components. I think that the most complicated of these standard objects is Microsoft Chart and, as a result, it’s also one of the most useful. Not everything about it is hard, though. Since MS Chart is part of Access’s standard install process, you’ll find the object on most computers with Access, making it easy to add to your applications. Adding a graph to a form is also easy: Select Insert | Chart from the menu, then draw the Chart on the form. The form wizard will guide you through the process of setting up the graph and associating it with a table or query to display its information. The Chart object is complicated because it has so many features and because they’re interrelated. Generally, setting one property requires you to change some other property in order to make the object work the way that you want. Access’s wizards also make the graph object appear to be a fully integrated component like a text box, but the Chart object really needs to be managed with code in the same way that you might manipulate Excel from Access. In fact, as I’ll demonstrate, you can use Excel to help you work with the Graph control. I’ve provided a demonstration database called Smartgraph.MDB in the accompanying Download file. In that database, there’s a table called zWorld_Demo and a form called z_GraphPlus. The form has the Chart object embedded in it and contains the Visual Basic code that I use in this article to manipulate the object (see Figure 1). If you find the form useful, you could import it into your application and change the row source to suit your data. The code under the form will work for any data. Table 1 shows the format of the table whose data I’m graphing and some of the sample data. Table 1. Sample rows from the zWorld_Demo table. In this code, GraphType is the name of the option box on the form. [GraphFX] is the name of the Chart control. What I’ve done in the form’s design is set each of the option box’s choices to a number that matches one of the constants used by the Chart object’s ChartType property. In the form, the “Bar Graph” option box has its OptionValue property set to 57, the value of xlBarClustered constant. When the user selects the Bar Graph toggle and I set the GraphType property to the value of the option box, it’s equivalent to setting the GraphType property to xlBarClustered. Table 2. The constants used in MS Chart to change the graph type. Generally speaking, it’s bad practice to store constants as hard-coded numbers in your application. In this case, the resulting code is so simple that I feel it offsets the problems raised by embedding the constants in the ToggleButtons. This example demonstrates that if you alter a property of the graph is some way, it’s fairly likely that other parts of the graph are going to be affected. When this is an issue, you’re going to have to work out a way to fix those other properties with some compensating property changes. This is one of the reasons that manipulating the Chart object can be time-consuming. The other lesson in this code is to use the With statement whenever you can when programming with the Chart object. The With statement not only makes for cleaner looking code, it also improves performance because the With statement creates a single reference to the object rather than a reference for each line of code. I found that I could learn most of what I needed to know about working with the Chart object by using IntelliSense to list the Chart object’s methods and properties. This might not work for you if you haven’t been involved with graphs before, but it sure beats hunting around the very poor documentation and examples that come with the object. 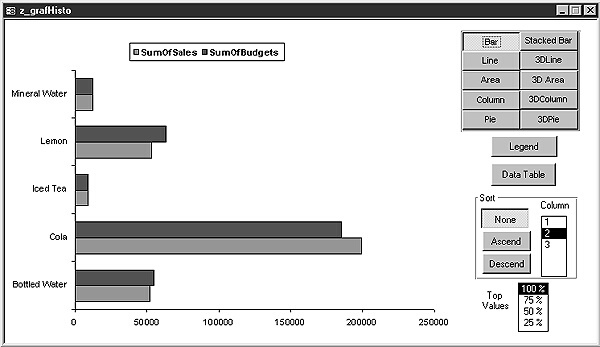 Figure 2 shows the IntelliSense support for the Chart object. To get the IntelliSense support, I’ve used a couple of tricks that need explaining. To begin with, I had to select the Microsoft Graph 8 object library in my project’s References list. The code that I’ve used so far doesn’t require this library to be referenced. This is deliberate because the Chart object isn’t a standard reference when Access is set up on a new machine. If you’re going to do a lot of Chart manipulation, I’d keep this reference selected. Since I already had the [GraphFX] reference to work with my Graph object, I didn’t bother setting Tester to point to the Chart also. With the Tester variable declared, however, I could use Tester with IntelliSense to display the methods and properties of the Chart object. Selecting the method or property that I wanted from the IntelliSense list helped me generate the code that I needed. I’d then cut and paste the code from the Tester variable onto my [GraphFX] reference. By using the full reference to the Chart object with ControlName.Object.Application.Chart, I can delete the library reference to the Graph 8 object library after I’m done creating my code. The second tool that I used to explore the Graph object was the Object Browser. I used the browser to find the actual values of the constants associated with the object. Using the Object Browser also requires that you set a reference to the Graph 8 Object Library. You can open the Object Browser from any code module by pressing the F2 key (or from the menu by selecting View | Object Browser). With the Object Browser up and running, you can select the Graph Library from the Libraries list and view the Constants that appear after all of the Graph classes (see Figure 3). When I’ve finished using IntelliSense and the Object Browser, I turn the reference to the Graph 8 Object library off and recompile/test the code. The Chart object can be used with other versions of Access, though there are differences. 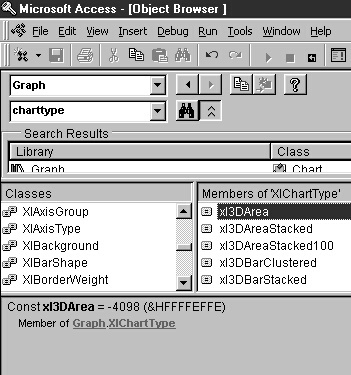 For Access 95, you’ll need to reference the Graph 5 library. The settings inside the Chart object are different for the two libraries. If you’re programming for Graph 5, you’re not going to get IntelliSense to help you out, making life that little bit harder. Instead, you can take advantage of the fact that the Chart object is closely related to charting in Excel. This lets you try my “Excel cheating methods” to find out some of the object’s more difficult settings. 1. Enter some data into the spreadsheet. 2. Make up a graph inside Excel, using the Chart Wizard. 3. Start recording a new Excel macro by selecting Tools | Macro | Record New Macro. 4. Make the changes to the graph that you want to make in Access. You do this by right-clicking on the part of the graph that you want to alter and selecting an option from the popup menu. 5. Stop recording the macro. 6. Return to Tools | Macro and open the macro you just created. This will display the Visual Basic code generated by your change to the graph. My Excel cheating methods let you generate the Visual Basic code to do many things with your Access graphs without anywhere near the steep learning curve. This method won’t always return the correct code, but it sure will give you a good start on the properties that you should be manipulating. All of the preceding techniques for controlling Microsoft Graph will add some pizzazz to your displays, but the real art of making graphs work is in setting up the correct queries to feed your graph. You manipulate the queries through the Graph object’s RowSource property. sortVals = icount & ";"
sortVals = sortVals & icount & ";"
' a consolidation query, so first I remove it.
' Now add the appropriate sort.
' Update the rowsource with the new query. There are two invaluable Microsoft downloads that you should use if you want to work with the Graph library. The most important one is the Microsoft Graph examples database, which was the catalyst for many of the ideas in this article. You should also download the Microsoft Knowledge Base Help file and look for article “Q154582: How to Use Automation to Change a Graph Chart Type” (I explain how to get it at http://www.gr-fx.com/tips/99/freestuff.htm). You can find a diagram of the full Graph 5 object model at http://premium.microsoft.com/msdn/library/techart/msdn_msgraph5.htm. In this article, I’ve given you enough information to start creating interesting applications with Microsoft Graph. As always, when you start to program with multiple tools, bear in mind that the costs of programming and support will be higher than simply staying within the Access envelope. Also, remember that there are third-party graph controls around that might just do the job better and easier than MS Graph. Graph, however, provides you with a tool for creating Access applications that comes with the most popular software package in the world — Microsoft Office. A couple of months ago, I became involved in a project for a company that sells a popular management analysis program written in Visual Basic 5. The aim of the project was to replace a third-party graph control with the Chart control that comes with Visual Basic. Even though I’ve been involved in graphing-related activities over a long period of time, I’d never taken a look under the hood of the Microsoft Chart control. I simply assumed that it would be very similar to the Graph objects that come with Office 97. This turned out not to be the case, which made replacing the third-party control that much tougher for me. The Graph objects that Microsoft ships and the products that they ship with are shown in Table 1a . The first difference between these objects is the way that you interact with them. For all of the versions that ship with Access, the object is smart enough to allow you to pass it a SQL string to use as a datasource. This is the most flexible programming method, as it will handle any amount of data. Access runs the SQL statement and turns the query results into a spreadsheet grid before passing the data to the chart control. Table 1a. The Graph objects and the products they ship with. The Chart control in Visual Basic 6 will allow you to assign an ADO data control as a datasource for the object. With the Graph object that comes with Excel, you must insert the data into some cells in the spreadsheet before graphing it. 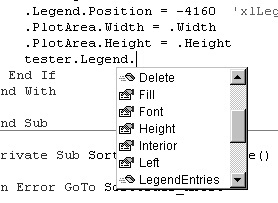 The Visual Basic 5 Chart control requires that you load a two-dimensional array to populate the control. The most significant changes between the current and previous generation of tools is in Visual Basic. The Chart control in VB 5 had a very primitive look. Among other things, the histograms lacked borders and some of the 3D displays were unusable. The different chart styles that were supported were limited even compared to the version of MS Graph that came with Access 2. VB 6 brought a number of changes, including the ability to work with ADO datasources. The final difference between the various versions is the time that it takes to set up the graph at design time. Excel definitely wins out in this area. With Access, you not only have to battle with a tougher customization environment, but you also have to ensure that you’re starting off with good data before you begin to manipulate the chart. The Visual Basic Chart control has fewer properties to manipulate than the Graph object and is generally a less effective tool than Graph/Chart 8. So now that the graphing project is coming to an end, what did I do? I wrote a custom graphing ActiveX control. This wasn’t my plan, but the final control did everything the customer wanted, was far simpler to implement into their product, and was only about 100K in size.